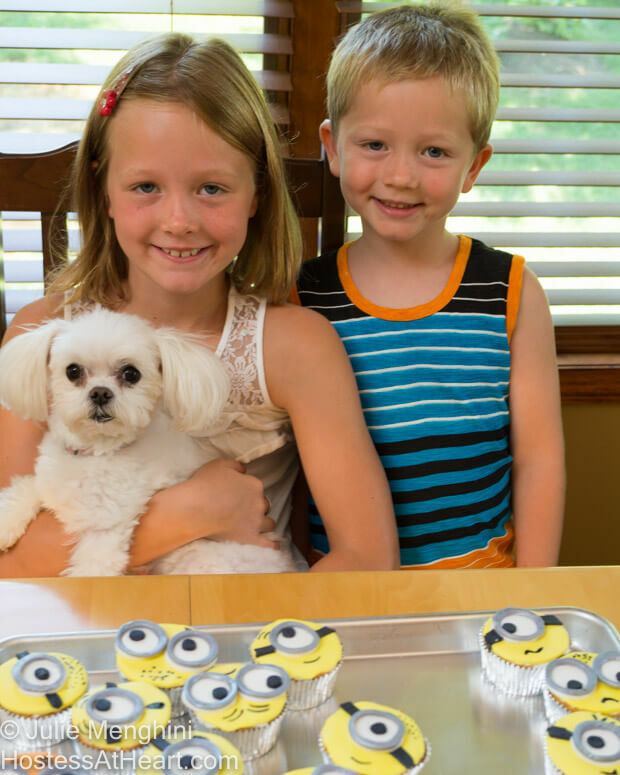 Making Minion Cupcakes is the perfect project to make with children of any age. They’ll just love watching their cupcakes come to life. John and I are very lucky to have the neighbors that we do. You may recall the Rainbow cupcakes or the Birthday cupcakes that we made for Amelia. We love spending time with these kids, and making Minion cupcakes will guarantee all of the little people help that you could ever want. Not long ago, Amelia’s father celebrated a birthday. Every birthday in their household is a great opportunity to get together. I was visiting with Amelia, and we discussed her love of “Minions”. Honestly, the only thing that I know about Minions is from what I see on commercials. However, I had seen some adorable Minion cupcakes by Eats Amazing on Pinterest, and before I went home, Amelia and I had a date to make some Minion cupcakes. 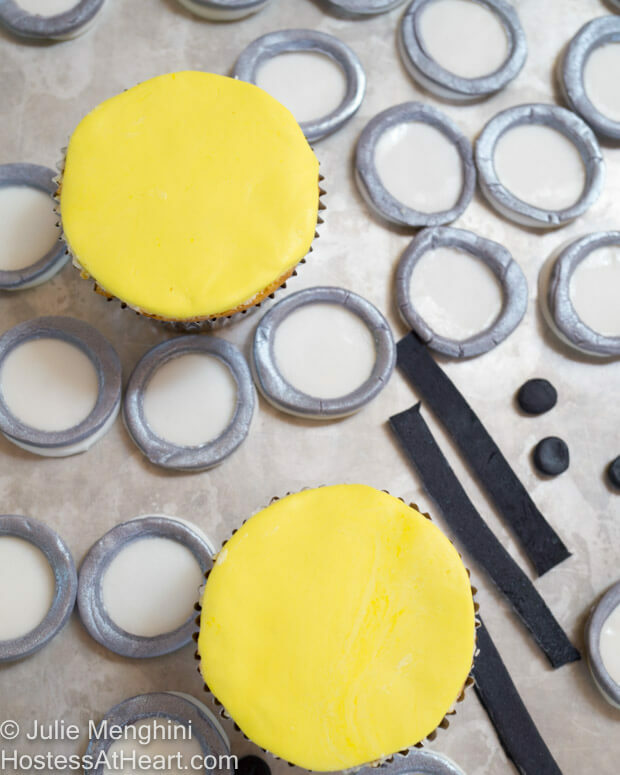 The morning before our agreed upon meeting time, I baked the cupcakes, leveled the tops with a cake cutter, and cut out yellow fondant to cover the tops of the cupcakes. I also made the Minion eye pieces by rolling and cutting the white of the eyes. I colored the white fondant gray and cut out the same size circle for goggles. I then took a smaller circle to cut out the inside of the goggles. Lastly, I colored and cut out small black circles for the iris of the eyes and small goggle straps. 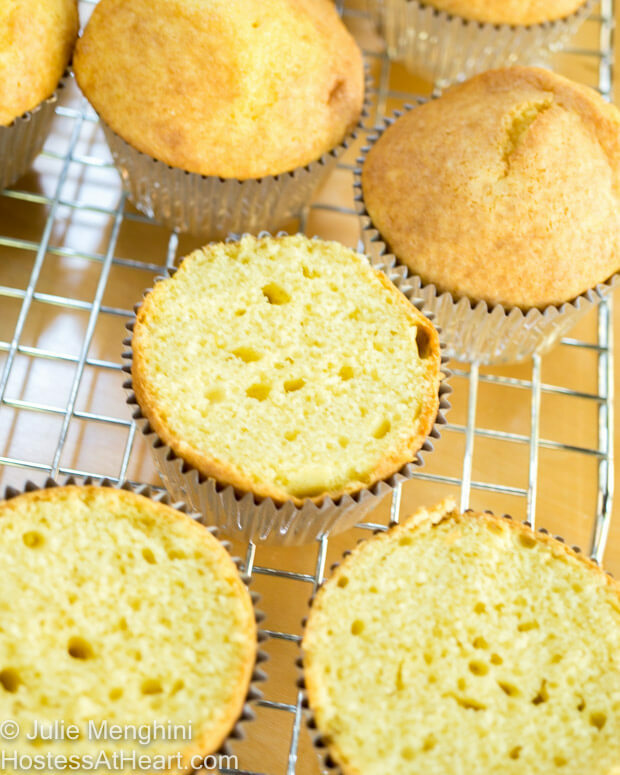 It’s best to make these ahead of time so that they can dry. I also glued the whites of the eye to the goggle circles. Amelia and I had the pleasure of her brother Benjamin’s help. So when we were all together, our job was to glue on the eyes, place the iris’ in the eye and to draw on the facial features with an edible marking pen. We ended up with some great looking Minions! Benjamin even made one for his mother. It had to have two eyes because he was sure one eye would “freak” his mother out. I’m very glad that I did the prep before these two little minions came over. They could dig right in and have some fun. When you’re working with little ones the key is not to have much waiting time. They want to plow through to the prize. Thank you! They were so much fun to make too! Too too cute!! Thank you so much for linking up at Tasty Tuesday! 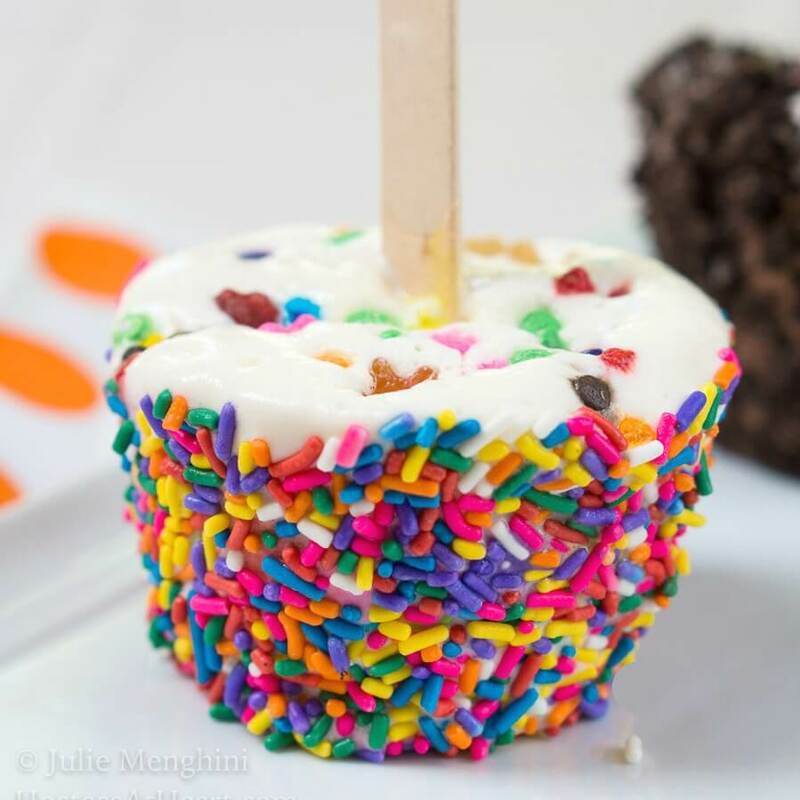 This post has been pinned on the Tasty Tuesday Pinterest board! I love having you and can’t wait to see you next week! Thank you! They were so much fun to make, and the kiddos had a great time. These are so stinkin’ cute! I’m such a shy baker but dying to get more creative with it. Is fondant hard to work with? Thanks for adding your deliciousness to #SaucySaturdays. Thank you Christine! If you played with Playdoh, you can do fondant. There are tons of YouTube videos, but I did a Wilton class a few years back with my daughter. We had a ton of fun. A lot of it was simple stuff, but it helped. My daughter has done some wedding cakes. No thank you! These are so cute, Julie! Looks like the kids had a lot of fun too! Thanks Michelle! I think I had as much fun as the kiddos. Thank you Chitra! I am sure she would have a great time watching mother make her these treats! A lot of work for those yellow faces, but they look amazing. You are a true artist! These are adorable, Julie! I love them. I have never worked with fondant before. It has always kind of intimidated me. You make it look so easy. They really came out great! What a fun project to do with your friends. Thank you! My daughter and I took a cake decorating class together. I was scheduled to take one when I was pregnant with her but didn’t get around to doing it until she was an adult! If you can play with Playdoh you can do fondant. We had a ton of fun. I let them cut out all kinds of fondant shapes to take home for the next time their mother made cupcakes. So cute! My daughter would love to have a go at making these too. Thank you Corina! I know she would love putting these together! My little helpers had a ball and I am VERY glad I had all of the pieces ready for them to use. They were so proud of their creations. Just a couple of weeks back I saw the last minion cartoons! They are so funny! 🙂 Love your cupcakes-well done! Thank you! I have yet to see the minion shows. I’ve heard that they are very funny. My husband can now name about 5 of them do to heavy discussions and goggle with these kiddos. Thanks Lili! I think I had as much fun as the kiddos, but was very happy that the prep was done before hand! Thank you! I’m lovin SaucySaturdays! It’s so fun for me to do these things with my little neighbors. I attribute my love of baking to cooking with my grandmother. I’m sure your baby will have some wonderful memories of doing the same with you! Awe thank you Dawn! I did have as much time as the kids! I even got a note on here from their Californian Grandmother, who I’ve met several times. That was really special! Love it Julie!! Those are two of the cutest minions I’ve ever seen!!! They are just as sweet as they are cute because they have one of the nicest grandmothers I’ve ever met! I LOVE THIS Julie!! 😀 Unbelievably adorable! I would have been enormously happy to have those cupcakes! Thank you Linda. I really enjoyed my time with these kids and the planning was so much fun. 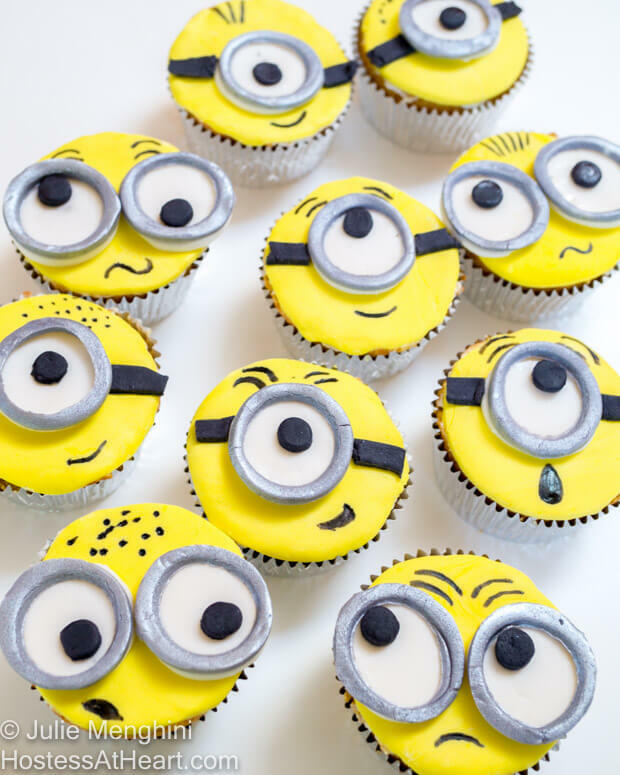 Cute minion cupcakes for cute minions…adorable, Julie! I love how they all have their own personality; what great and thoughtful decorating! Thank you! Those kids had a lot of fun deciding exactly where to put those features. Thank you Lily! Minions are really popular, and I loved listening to the children talk about them as if they knew them. I sould watch the movie so I can get into the grove! OMG, they are so adorable and timely. You see them all over TV in commercials, so these cupcakes would sell like crazy. You should have them for sale. Ha, thank you! I’ve got too many irons in the fire already. I love giving them away to little minions that love them. I love minions and their gibberish talk…so please pass me one! Oh, these cupcakes are cute, and look delicious…I don’t know if I can even eat them! Okay, I will just look at those adorable expressions and feel happy! Baba ba baba banana…! Thank you! Honestly, I didn’t eat one. I gave everyone of them away but was really happy that there were some children that just loved them. I’d happily pass you one over! You have some awesome decorating skills Julie- they look identical to the cartoon characters. Happy FF! Thank you Jess! I just love detail work and had a ton of fun putting these together. I haven’t seen Despicable Me either, but my husband can now name at least 5 of their names after being instructed by my little neighbor people. I know! There is one more a little older and they definitely came from the same place. We had a lot of fun together. These are so incredibly cute, and what sweet neighbors you have! 🙂 My daughters would love to bake these cute treats! Wish you lived closer, Julie! Me too Anna! We could have a Minion party! Aww, what a lovely neighbor you are Julie, and I’m sure the kids had a blast. I’ve seen minions before, but don’t know much about the craze. You are amazing and these are too adorable! I am in awe of what a great baker you are! Thank you Linda! They were all adorable, and their mother will love seeing you say that. Adorable neighbors and cupcakes! Wish you were my neighbor Julie! They look so kawai. I am sure the kids were in two minds – have the cake and eat it too!! We had a great time skd! It helped that most was done before hand. Thank you so much! They did turn out so cute and the kids (and their parents) loved them. Thanks for stopping by!